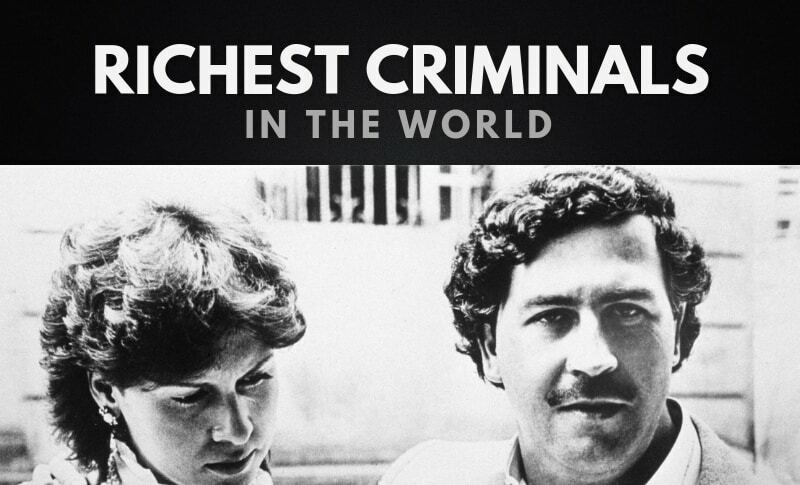 Who are the richest criminals in the world? We all know that doing bad things is wrong but now it’s clear that the payoff is pretty massive. There are people in the world who have made so much money through the underworld that they could start their own army. As you’re reading this, you probably already have names popping into your head as to who will appear on the list of the richest. Charles Manson was an American criminal, singer-songwriter and cult leader. Manson formed what became known as the Manson Family in California. His followers committed a series of nine murders at four locations in July and August 1969. As of 2019, Charles Manson’s net worth is $400 Thousand dollars. Nicky Barnes is an American former crime boss that was active in New York City during the 1970s. Two years later Barnes formed The Council, a seven-man African American organized crime syndicate that controlled a significant part of the heroin trade in Harlem, New York City. Nicky Barnes net worth is estimated to be $500 Thousand dollars, as of 2019. Lee D’Avanzo was a meaty tough guy with a cleft chin. Avanzo is the son of a car thief and loan shark who was killed in 1977 after trying to run from an FBI agent. The younger D’Avanzo achieved notoriety last year as the husband of Drita D’Avanzo in the tv-show ‘Mob Wives’. As of 2019, Lee D’Avanzo’s net worth is approximately $500 Thousand dollars, making him the 18th richest criminal in the world. George Norman is an American criminal that was caught abusing the five-year-old by her horrified mother at their home in Basildon. The court heard the pensioner was jailed for two-and-a-half years in 2005 for sexually touching for children. Norman had lied to the family about his previous convictions by telling them he was jailed for drugs. As of 2019, George Norman’s net worth is roughly $500 Thousand dollars. Michael Franzese is a former New York mobster and caporegime of the Colombo crime family. The family was heavily involved in the gasoline tax rackets in the 1980s. Franzese has since then become a devoted Christian and created a foundation for helping youth. As of 2019, Michael Franzese’s net worth is approximately $1 Million dollars, making him the 16th richest criminal on the list. Hector Pagan is a former associate of the Bonnano Crime Family who would become an informant. Pagan is most known for being the ex-husband of Renee Graziano who is the star of ‘Mob Wives’. Graziano is also the daughter of notorious Bonnano Anthony Graziano. As of 2019, Hector Pagan’s net worth is $1 Million dollars. Freeway Rick Ross is an American drug trafficker and author who is best known for the drug empire he established in California in the 1980s. Ross was sentenced to life in prison, though the sentence was shortened on appeal and Ross was released in 2009. As of 2019, Freeway Rick Ross net worth is approximately $1 Million dollars. Ross is the 14th richest criminal in the world. Sammy Gravano is a former underboss of the Gambino crime family and is mostly known as the man who helped bring down John Gotti. Gravano agreed to testify against Gotti and other mobsters in a deal in which he confessed to involvement in 19 murders. As of 2019, Sammy Gravano’s net worth is $2 Million dollars. John Gotti Jr. is mostly known as “Junior” Gotti is an American mobster who was a boss of the Gambino crime family from 1992 to 1999. Between 2004 and 2009 Gotti was a defendant in four racketeering trials which all ended in mistrials. As of 2019, John Gotti Jr.’s net worth is estimated to be roughly $10 Million dollars. Frank Abagnale is an American consultant known for his history as a former check forger, impostor and confidence man. Abagnale became one of the most famous imposters in the history claiming to have assumed no fewer than eight identities. He is currently a consultant and lecturer for the FBI academy. As of 2019, Frank Abagnale’s net worth is $10 Million dollars, making him the 11th richest criminal in the world. Ephren Taylor is the man who devised a schema to trick more than 400 people out of $16 million. Taylor was sentenced to 19 years and seven months in a federal prison, the U.S. Attorney’s Office said Tuesday. As of 2019, Ephren Taylor’s net worth is approximately $10 Million dollars, making him the 10th richest criminal in the world. John Gotti was an Italian-American gangster who became boss of the Gambino crime family in New York City. Gotti quickly rose to prominence, by becoming one of the crime family’s biggest earners in the history. As of 2019, John Gotti’s net worth is estimated to be roughly $30 Million dollars making him the 9th richest criminal in the world. Rayful Edmond is an American drug lord in Washington D.C. in the 1980’s. Edmond is credited with introducing crack cocaine into Washington D.C. The crimes in the Washington D.C. was escalating and was known as the “murder” capital of the U.S.
As of 2019, Rayful Edmond’s net worth is $50 Million dollars. Big Meech “Black Mafia Family” is a drug trafficking organization formed in Detroit. The organization was founded in the late 1980’s by the brother Terry Flenory and Demetrius. In 2000 they had already established cocaine distribution sales throughout the U.S.
As of 2019, Big Meech’s net worth is estimated to be $100 Million dollars. Big Meech is one of the richest criminals on the list. Al Capone is also known as “Scarface” was an American gangster and businessman who attained notoriety during the Prohibition era. Al Capone was the co-founder and boss of the Chicago Outfit. Capone’s seven-year reign as a boss ended when he was 33 years old. As of 2019, Al Capone’s net worth is $100 Million dollars. Al Capone is one of the most popular and famous criminals of all time. El Chapo Guzman is a Mexican drug lord who formed the Sinaloa Cartel. The criminal organization was named the Mexican Pacific coast state of Sinaloa where it was formed. El Chapo became Mexico’s top drug king in 2003 and was considered the most powerful trafficker in the world. El Chapo Guzman’s net worth is estimated to be roughly $1 Billion dollars, as of 2019. Griselda Blanco was mostly known as “La Madrina” and “The Black Widow”. Blanco was a Colombian drug lord of the Medellin Cartel and a pioneer in the Miami based cocaine drug trade in the 1950s. Blanco was responsible for over 200 murders while transporting drugs from Colombia to New York. She died in 2012 when she was shot and killed at the age of 69. As of 2019, Griselda Blanco’s net worth is $2 Billion dollars, making her the 4th richest criminal in the world. Adnan Khashoggi was a Saudi Arabian billionaire businessman who is best known for his lavish business deals and lifestyle. Khashoggi is one of the richest criminals in the world because of his lavish businesses around the world. As of 2019, Adnan Khashoggi’s net worth is roughly $2 Billion dollars. Carlos Lehder is the co-founder of the Medellin Cartel and former Colombian drug lord. Lehder is currently imprisoned in the U.S and was born in Armenia. Lehder eventually ran a cocaine transport empire on Norman’s Cay Island. As of 2019, Carlos Lehder’s net worth is approximately $2.7 Billion dollars. Leona Helmsley was an American businesswoman mostly known for her reputation for tyrannical behavior, earning her the sobriquet “Queen of Mean”. Helmsley was investigated and convicted of federal income tax evasion and other crimes in 1989. As of 2019, Leona Helmsley’s net worth is $8 Billion dollars, making her the richest criminal in the world. How many of these criminals did you expect to appear on this list of the richest criminals in the world? Leave a comment below.